Official Viwawa Blog: Sneak! Harvest Time. Harvest time is approaching, are you ready? Grab and secure that bag of rice! Here's a sneak peek at Viwawa's latest offering, Harvest Time. Harvest Time is a climbing game that requires 3 players. No more, no less. 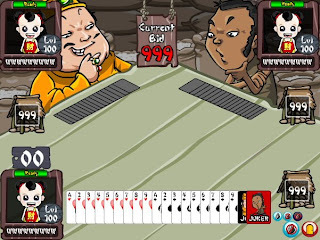 In each game, 2 players will co-op to vs the "landlord". The aim for each team is to play out all his cards in valid combinations. Speaking of combinations, there's loads of them! Check it out here for more details regarding the general rules. Look out for the launch of Harvest Time any time this week! Tat's why this is posted sometime b4 the game is released, so that gamers are able to read up and get to know the game. =.=" i read already still can't get wat's the game about and how to play... ZZzz.. =.="
Admin please inform all the gamers after u fixed those reported bugs..